It was the East San Gabriel Valley Bird Society's first annual auction, and I was finally able to make the meeting. The auction was my first and I thoroughly enjoyed it. The auctioneer didn't know anything about birds, so he kept starting the bids too high and couldn't pronounce most of the terms (cockatiels were "cockatails," and the guy's first item was a "HF male W/F cockatiel"). He ran the event well in spite of himself, and constantly made jokes about the items. 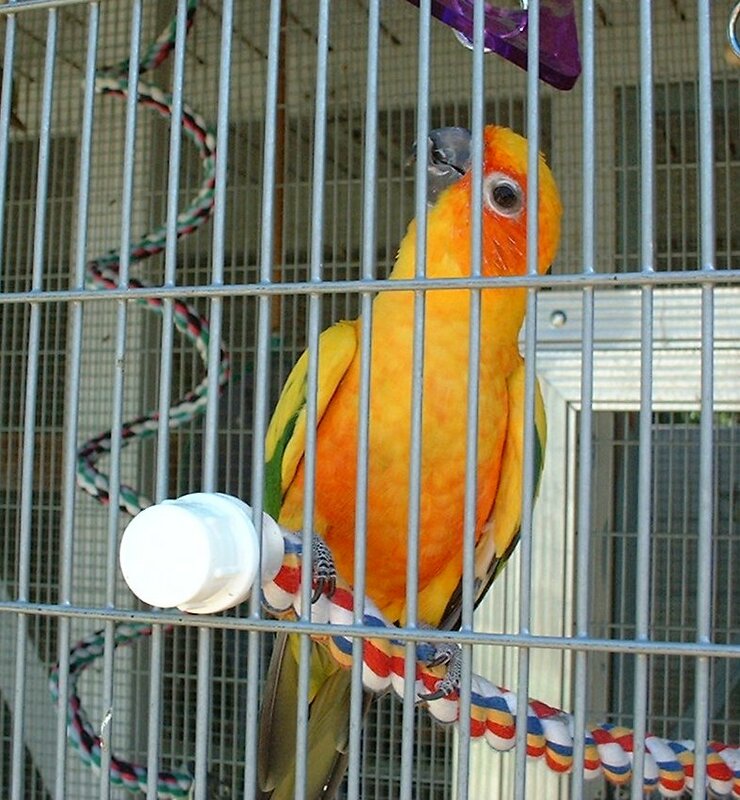 The item that sold for the most was a handfed goldcap conure. This thing was hot! The bid narrowed down to two people competing and ended at around $300. Imagine my surprise when he opened the bid for a handfed sun conure with scissor beak, and no one made a move. I'd been hoping to get the bird ever since I saw it on the item list. I started the bid at $100. The auctioneer kept calling for other bids but still no one made a move. My friend Jaynee leaned over and whispered, "You're going to get it." Finally someone else upped the bid, but they didn't seem too interested in claiming the bird. I ended up with a bird worth $600 retail for only $140 just because it had scissor beak. It amazes me how people will ignore perfectly healthy birds just because of minor deformities. No disability will affect the pet potential of a bird , and even something like scissor beak won't inhibit breeding. Scissor beak is usually caused by improper handfeeding, an injury or a deficiency. During handfeeding, the syringe is supposed to enter the beak from left to right, but for various reasons this can cause the upper mandible to move to one side. Handfeeders who notice the beak moving at all should (carefully) start rotating to feed from the other side as well. If the beak gets too bad, surgery or costly vet work may be needed to correct it. If not treated at all, you'll wind up with a bird whose upper bill permanently grows to one side. This is what happened to Jay-Jay. Jay-Jay has become my new pet. As some of you have read, I usually recycle my pets to breeders and back. Many of my pairs are former handfed pets, and I sometimes keep my own handfed chicks as temporary pets until they are old enough to breed. 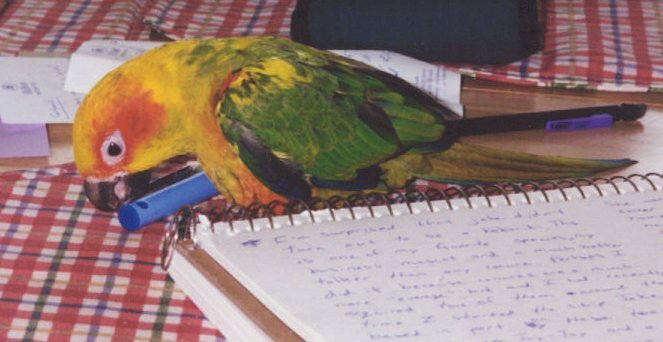 My last real pets were a greencheek conure, Confetti, an Indian ringneck, Yellowbird, and a crippled kak named Toast. Toast has since passed. Confetti was a sweety but very skittish. I was hoping she would make a good breeder/pet, but getting her a mate turned out to be a mistake. I gave Yellowbird to my aunt who wanted to breed ringnecks when I moved. She and her husband Mike have her as a pet inside the house. I'm told that Yellow absolutely LOVES Mike. 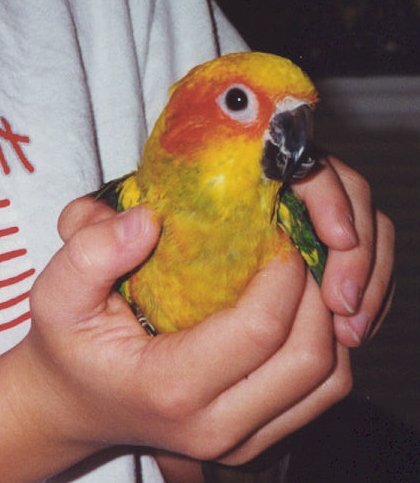 I'd always thought about getting a sun conure, but the price and the loud noise always kept me from doing so. Jay-Jay is a sweet little girl who loves to have her head scratched and to be rubbed under the wings. She eats fine (for those of you wondering) but will need her beak groomed once every couple of months or so for the rest of her life. All articles and images contained on this site are © 1999-2002 by Feisty Feathers unless otherwise noted and may not be reprinted or used in any way without the author's permission.